Apple’s oft-forgotten cofounder, Ronald Wayne, is selling his final collection of early Apple documents for tens of thousands of dollars. Wayne, now 80, was one of three people to sign Apple Computer’s original founding contract in 1976. Although he was given a 10% share in the fledgling company at the time, he sold it for $US800 not long after. Wayne decided to sell his stock because he was burned by past business failures and he didn’t want to be personally liable for any Apple Computer debt, according to Computer World’s Greg Keizer, who interviewed Wayne. Selling that early stock (and later forfeiting any future claims on the company for $US1,500), obviously cost him a lot of money. Proof sheets for the Apple-1 Operation Manual: A COMPLETE SET OF PROOFS collected by Ronald Wayne, with the exception of the folding schematic that would have been printed by a different process. 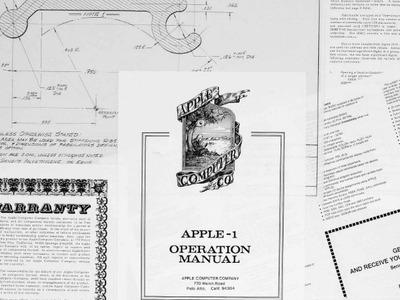 Personal archive of preparatory drawings and blueprints for the casing of the Apple II Computer: Wayne’s drawings and blueprints show the enclosure, panels, door, hinges, pivots etc. The final version of the Apple II was introduced on 16 April 1977 at the West Coast Computer Faire. Although the final version contained certain recognisable elements of Wayne’s early renderings, such as the gently sloping front panel holding the keyboard, the result was quite different. This series of renderings illustrates the rigorous industrial design process employed in Apple’s formative years: a process that can certainly still be seen in the company’s adventurous, innovative leap forwards in its combination of applied science and design. Apple-II. Advance Order Information: As most examples would have been filled out and returned to the company, an original example, unmarked, is a very rare ephemeral piece of Apple history.